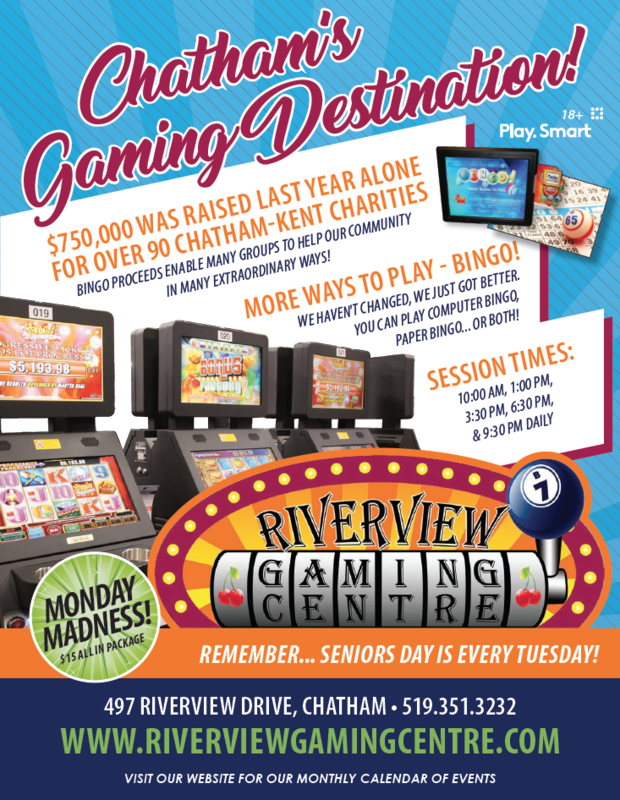 Riverview Gaming Centre, formerly known as Riverview Bingo Palace, is located at 497 Riverview Drive in Chatham, ON. The new name better reflects everything that is available for customers. We are more than a Bingo Hall now! This gaming facility includes 5 Bingo sessions daily at 10:00a.m., 1:00p.m., 3:30p.m., 6:30p.m. & 9:30p.m. and Cabinet Machines called TapTix machines. TapTix machines are available for play at all times that the Gaming Centre is open. Hours of operation at Riverview Gaming Centre are Sunday to Thursday 9:00a.m. to 12:00a.m. midnight and Friday & Saturday 9:00a.m. to 1:00a.m.! Over 90 charities work together with Riverview Gaming Centre to raise funds for their clubs, organizations & schools. These funds help our charities do lots of great things in our Chatham-Kent communities. Fundraising opportunities are also available for nonprofit groups including sports teams, groups raising money for special events, school groups or teams, etc. For more information, check out the Fundraising section on the Riverview Gaming Centre website. In recent years, our facility has undergone extensive renovations. We have added electronic bingo, new comfortable tables and chairs, an updated full service snack bar, electronic point of sales, upgraded security and sound systems, new flashboards, and new bingo machines for our callers. We now offer more ways to play Bingo. You can play electronic, paper, or a combination of both! We invite you to stop in and see our new facility! We have a busy monthly calendar at Riverview Gaming Centre. *Every Monday is Monday Madness. At all sessions on Mondays the $15 All- In Package is available. This package includes a 3 strip book, 3 Early Bird Cards, 3 SuperJackpot Cards and a Double Action Book. This package is valued at $23. *Every Tuesday is Senior Day. At the 10, 1 & 3:30 sessions we have extra draws for all of our registered Seniors. Registration is free. 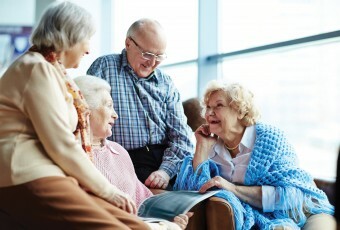 We also treat our Seniors to a free bowl of soup at our Snack Bar. *Every Wednesday We have draws for Extra Player Points. *Every Thursday We have a $5 Meal Deal at the Snack Bar. 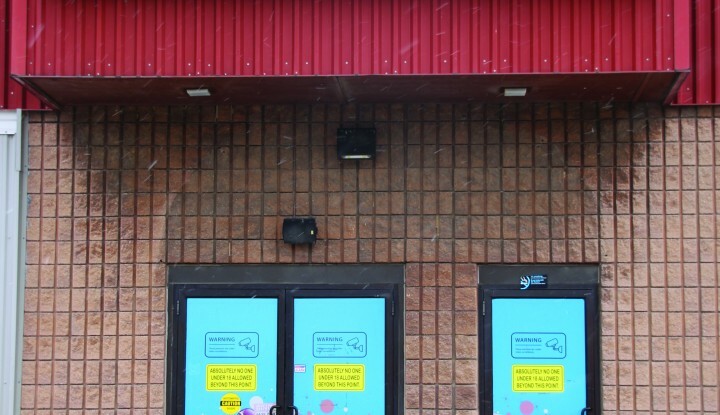 The Players Club is available to all players at Riverview Gaming Centre. Points are collected every time you play. Remember you can win extra points on Wednesdays at all sessions!! These points can be redeemed for a chance to win a weekly prize valued at $100 or the monthly prize valued at $1000. The weekly draws take place every Saturday and the monthly prize takes place on the last day of every month. Stop by the Sales counter and get your Free Players Card if you don’t already have one! TapTix machines can be played throughout the day and are not linked to the bingo sessions. Drop in for a few minutes or stay a bit longer. We have 25 TapTix machines available for your gaming fun! There is a chance to win one of the 2 progressive prizes at our TapTix machines that have grown to over $10,000!! 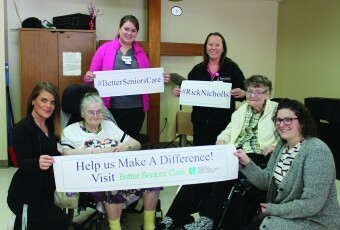 We invite everyone in the community to check us out! We thank our regular customers and look forward to meeting new players!